You have wise spiritual guides from the spiritual worlds of Crystals and Ascended Masters. They are ready to help you on your path of spiritual growth now. In Crystal Masters 333, Alana Fairchild, author of the bestselling Kuan Yin Oracle, continues the highly successful Crystal Spirituality Series, which began with Crystal Angels 444. She shares her unique approach to crystal healing, combining the natural healing properties of each crystal and its ‘crystal angel’ or ‘spirit’ with wisdom teachings from the loving Ascended Masters, such as Mother Mary, Kuan Yin, Jesus, the Buddha, Mary Magdalene and Merlin. Together they help you take the next steps on your path of spiritual growth, by preparing you with the teachings and tools you need to successfully navigate the demands of spiritual initiation. Initiation is a path of advanced spiritual growth. When you are highly committed to your spiritual path and personal growth this lifetime, you will be on the path of initiation. This path can be very challenging but offers incredible rewards including the awakening of spiritual talents, assistance in bringing your divine light to the world and support in your own role as a healer and spiritual leader on the earth. Each chapter deals with a powerful precious stone and its heavenly angel and features spiritual teachings and stories from Alana’s own life and work, as well as a healing process to help you fully harness the therapeutic potential of that stone and connect directly with the Ascended Masters, to receive their wisdom and blessings. ?? You will delve deeply into a variety of topics including aligning with divine will, healing the child within, planetary healing, spiritual communication, enlightenment and spiritual growth, the light body, the golden body, and much more. ?? You have important healing work to do on yourself and for the planet. 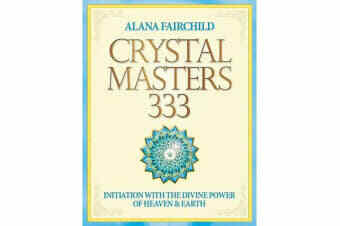 Crystal Masters 333 is written for you, to help you successfully complete your task, with greater happiness and fulfilment. Featuring 18 full-colour Crystal Angel Mandalas by artist Jane Marin.